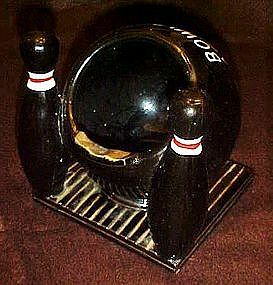 This heavy ceramic ashtray features a bowling ball and 2 pins, painted black with gold, red and white cold painted accents. Very solid, won't tip over.Big enough for the entire bowling league! Made of glazed red clay. Probably Japan made. It is in excellent condition, free from chips cracks and repairs. Measures approx. 6 1/2"" tall x 6" across. They made a smaller size, but this is the "big" one! !